The 'story' is similar to that of my Playmatic repair guide. A few years ago I got a Recel Fair Fight pinball machine. I didn't know anything about that brand of games, didn't find any information on the internet.. The machine didn't complete its selftest, from the manual I had found I learned it was a problem with the ram.. Replaced the ram IC, still the same problem.. Didn't find anyone else who could fix the game so I sold it off cheap. I was however interested in this company and found it a shame that again a game could not be saved. The machine was complete, looked very good, but just didn't want to start a game. So therefor I added this part to my website: to compile as much repair information for Recel System III games as possible, so other people can use it to repair their games. This page is always under construction.. when I find new information it will be added to this website. It seems this company changed names a few times.. There was Euroflip, then Recel, then it changed into Petaco (Proyectos Electromecanicos de TAnteo y COntrol). 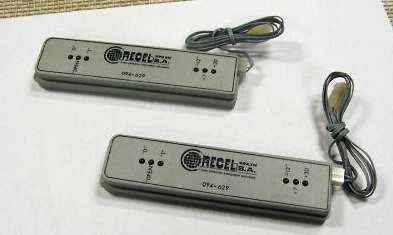 Recel was the exporting company of the Spanish company called PETACO, S.A., back in the 60�s, 70�s and early 80�s. The founder was called Juan Paredes Hernandez. After bankruptcy of Petaco he then shortly after opened 'Juegos Populares, S.A.' in the early � mid 1980's, which also manufactured pinball and other machines. Juan Paredes died in a car accident in Seville, Spain, in September of 1987 and this new company (Juegos Populares) was closed shortly after. Juan Paredes started importing Gottlieb machines (very early 60's), and started adapting them to the Spanish market and introducing enhancements. So much so, that Gottlieb sent many of their engineers over to see how they were managing to sell so much and how the improvements had been done. At a given point, Juan Paredes decided to manufacture his own pinballs. 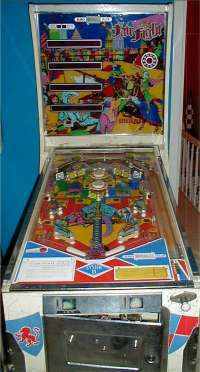 Thanks to his pinball machines success in Spain, many people call the game 'Petaco', which is actually the company name. An overview of games made by Spanish manufacturors can be found at PinballHispano.net. Documented here is the System 3 boardset by Recel. This is used on games Poker Plus, Fair Fight, Mr Evil and Crazy Race (maybe some others too ?). The Recel System III MPU is a custom design. It is based on the Rockwell PPS4 chipset, similar to early Gottlieb solid state machines (Gottlieb System 1). Games using this boardset were sold in 1978. The game also used led displays for the score. Recel games implemented some nice ideas, when you compare them to the American games of that time. The backbox is much smaller than on American games and easily folds down. Recel games (at least Fair Fight) also use longer legs. Similar to Gottlieb Sys80 games, the handle to secure the lockdown bar also locks the playfield so you can't move it up. 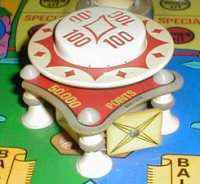 Finally some games had innovative features on the playfield, like the rotating target on Fair Fight. 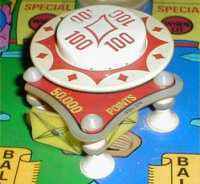 Poker Plus was also the worlds first game with a backbox that folded down. Interesting to know is that, similar to other European pinball companies like Playmatic and bingo manufacturing companies like Wimi, the playfields are not regular wood with soft varnish like USA-made pinball machines. The playfields have a sort of plastic coating which makes them almost indestructable. Playfield wear is almost non-existant and after cleaning most playfields will look brand new again. Also visit my bingo machines page. 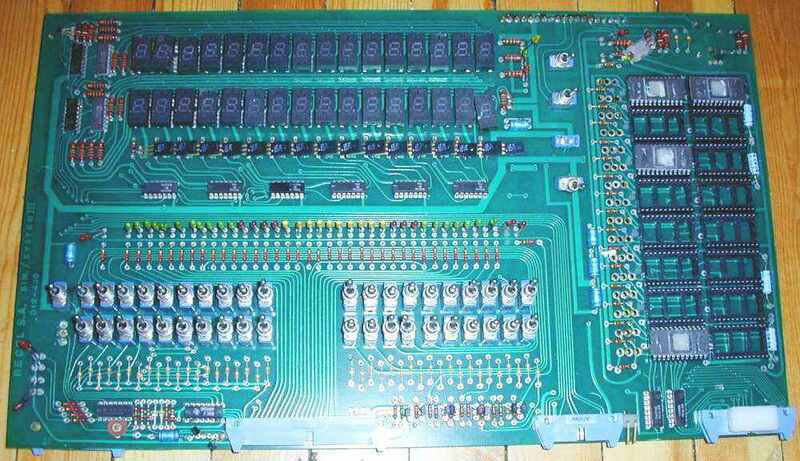 This is the cpu board used on Fair Fight. This is the driver board of Fair Fight. 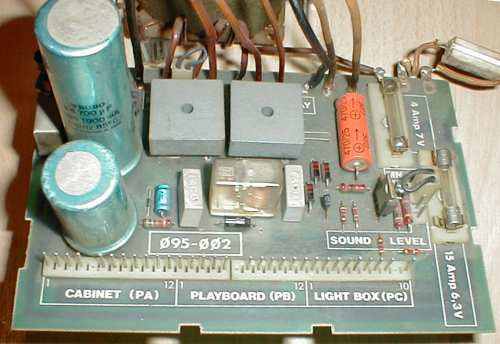 This is the power board in the cabinet, next to the transformer. This is another driver board I have. 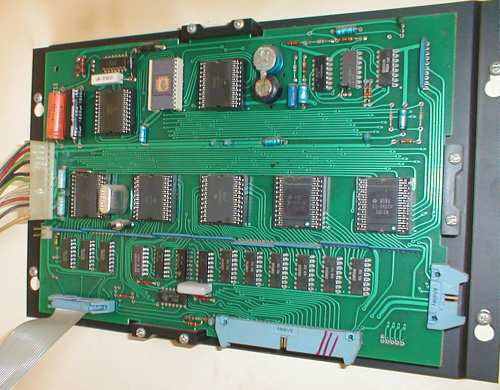 It is unknown from what game it is but it is different from the driver board of Fair Fight.. so it seems the Recel boardset existed in at least 2 versions ? Batteries: I have found that if you do not use a battery pack for the CMOS RAM, the system voltage that gets through to the chip is around 6.2 volts. This then causes the selftests to stop with CMOS error. Placing 4 x 1.2 volt rechargeable batteries in the system helps bring this voltage down and the selftests complete and the game runs. Note that for a 1702, Vdd and Vgg is -12V but for a 1702A it's -9V. Vcc is 5 Volts as usual. It's a PMOS part and the access time is 1 microsecond. 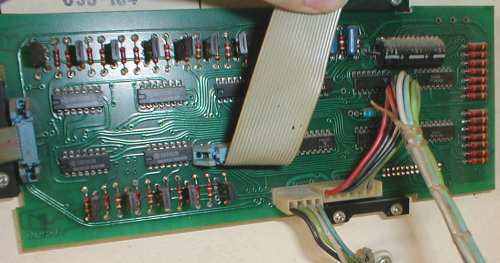 I'd look at the board currently holding the 1702's and check the voltage on the Vdd and Vgg pins, to be sure. So an adaptor would need to make about 50 mA of -9V (or -12V), which could be done with a Maxim part or an isolated DC-DC converter module followed by the appropriate voltage regulator. Wire the adaptor to a 24 pin male header with a 2708 signal configuration and you're good to go. The logic inputs and outputs are TTL levels. 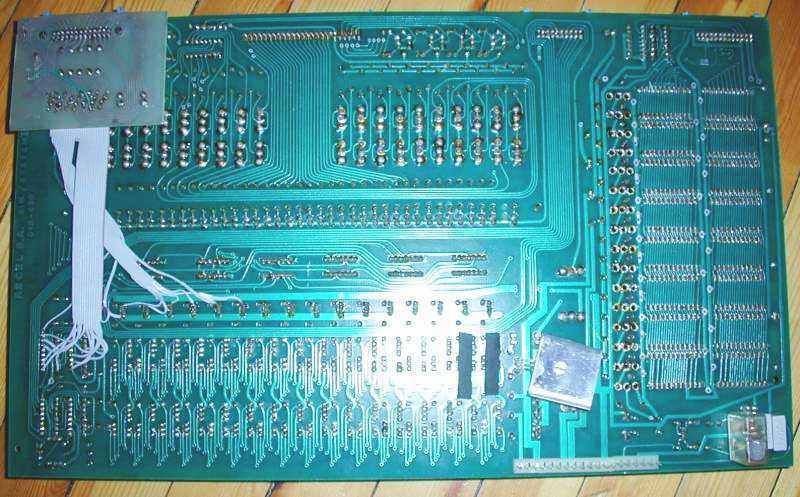 Arild from Norway sent me pictures from a Recel pcb he has. Click here for back side. This board is mentioned in the Recel System 3 PDF (see above). It's a complete tester that simulates the whole machine, all on one pcb. This is a tester board by Recel. It is not known if it's for use on Recel pinball machines or for their bingo machines. Credits: Thanks to Gary for a scan of the Poker Plus manual and some technical info. MrDoom manual by Rainer. Thanks !